I am SUPER EXCITED, you guys. I'm doing my first ever giveaway on this blog! Author Aimée Carter was kind and awesome enough to send me an AUTOGRAPHED copy of her debut novel, The Goddess Test to give away to one lucky reader. So awesome! 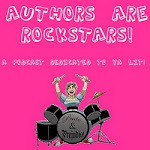 I talked about how much I enjoyed The Goddess Test on the May edition of Authors Are ROCKSTARS!, and then we did a mini podcast later that month, featuring an interview with Aimée. If you haven't checked out those episodes, please do! It was such a pleasure to chat with Aimée. So, The Goddess Test.... in this contemporary sequel to the Persephone and Hades myth, ordinary high-schooler Kate reluctantly enters into a bargain with Henry, the lord of the underworld. She'll stay with him for six months and endure a series of trials that will determine whether or not she is worthy of immortality. If she passes, she hopes he might save her dying mother... and it turns out she may be able to help shape his fate, as well. The stakes are high, though-- Kate's not the first girl to attempt the tests, and none of the others survived. This inventive premise hooked me in right away, and the excellent plotting and pacing kept me reading. It's full of references to Greek mythology (which I LOVE), but is not a strict retelling- it's fresh, charming, and creative. There's a very engaging mystery element to the story, with Kate trying to figure out what the tests are and how to pass them so she doesn't fail Henry. And why did all those other girls die, anyway? The gradual development of the relationship between Kate and Henry is fantastic. There's tons of chemistry between the two of them, and I have to admit I'm a bit of a sucker for those dark, brooding romantic heroes, so Henry as a modern-day Hades is quite swoon-worthy. The setting is gorgeous- I'm also a sucker for grand manor type settings, and this one is perfection! Kate's relationship with her mother is genuinely touching. Earn one entry just for leaving for your name and email. Earn TWO bonus entry for following my blog. You don't need to follow to win! But I appreciate my followers, and want to show them some extra love. Contest ends on Friday, July 22, at 8 pm PST. Winner will be announced on the blog and contacted by email. ETA: Contest is now closed. Thanks for the contest is great. I want tho read this book so bad. and if i have it signed will be great. thanks. Thanks for the giveaway Allison! I'm following you through blogger and twitter and I hope you follow me too. Thank you SO much for the contest. One of my students gave me this book to read and I finished it in like 8 hours. I couldn't put it down!!! it would be awesome to have an autographed copy for my students to share in my class library!! !